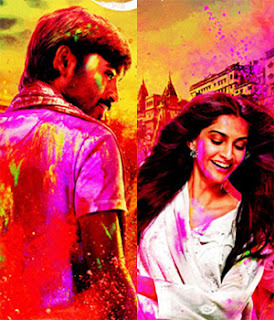 Movie Story: Raanjhanaa is the story of a simple Hindu boy (Dhanush) from Banaras, who falls deeply in love with a beautiful muslim girl (Sonam) and is ready to go to any limits for her. Little boy Dhanush falls in love with Sonam at the first sight. He follows her for many years and finally confesses his love for her. She rejects him at first but after a series of hysterical slaps, 15 to be precise, Zoya (Sonam) decides to meet him. After several meetings and a wrist-slitting exercise by Dhanush, they fall in love but their romance is short-lived as Sonam’s parents discover their secret affair and she’s promptly packed away to another city. Sonam returns to the city 8 years later to find that Dhanush is still madly in love with her and still equally ready to slit his wrist if she denies his proposal. But, Sonam has matured and does not give in to his demands, as she is no longer in love with him. Sonam declares to Dhanush that she is in love with Abhay Deol. Movie has a budget cost of 35 crore. In first of box office Raanjhanaa has archived target business of 20 crore. It is sure that movie will recover its cost. Watch this movie for the genuine performances by Dhanush and Abhay deol.